Sadly, Albert passed away February 1, 2016 at the age of 87. We thank God for the compassion Albert demonstrated during his lifetime and extend our heartfelt condolences to Betty and the family. Betty and her husband Albert, 2009. If you were to count the many gifts Betty Tiemstra inherited from her mother, the gift of generosity would certainly top the list. Growing up in Nazi-occupied Holland, Betty saw her mother’s generosity first-hand. Faced with the challenges of war and deprivation, it would’ve made sense for any parent to adopt an attitude of taking care of your own family first. But not to Betty’s mom. Every week, she made sure her family rationed what little they had so there would always be something left over to give to other families less fortunate than their own. “One time – I remember like it was yesterday – my mother came to me and gave me a tiny bottle of vinegar salad dressing,” shared Betty. “There was a boy living two streets down from us, and he had a disability – a mental disability – and his mother, she couldn’t get him to eat his salad because they didn’t have any dressing. So she told me to go to his house and give the dressing to his mother so she could feed him. And that’s what I did. Her mother’s influence of generosity certainly left its mark on Betty. Many years later – after leaving Holland and moving to Canada – Betty married and soon found herself raising a family of her own. She was the proud mother of nine children when tragedy struck in 1976. Her daughter, Marjorie, was attacked and shot by a gunman while she and her friends were walking home from school. Both her friends survived the attack, but Marjorie did not. This was a horrific time for Betty and her family, but they relied on the Lord’s strength. And it was her mother’s legacy of helping others that became the means by which Betty helped her own family recover from this devastating blow. Together, their family made the decision to move beyond their own hurt and see this tragedy as a chance to help someone else, and they became the caregivers of two young people with physical and intellectual disabilities. They brought them into their home and took care of them for three years. After Betty and her husband, Albert, completed their two years of service with Wycliffe in Papua New Guinea, they returned to Canada. Once they were home and reconnected with family, Betty’s mother introduced her to a new way of serving people with disabilities. She told Betty about an organization called, “The Christian Blind Mission” or cbm for short. Betty’s mother had already been giving to cbm since 1979, and suggested that it would be a cause Betty and Albert might also wish to embrace. 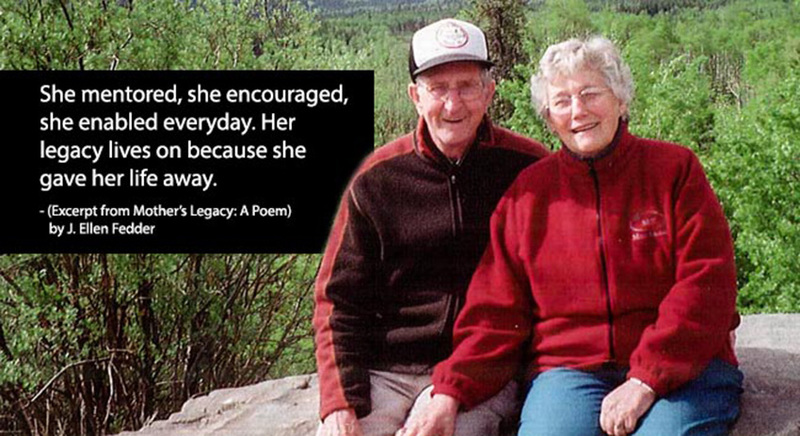 Today Betty and Albert are still faithful friends of cbm’s work and ministry. They’ve even arranged to each include a gift in their Wills. Their children have also carried on the family legacy of helping those with disabilities. Two of their daughters work as nurses while their other children continue to serve people with disabilities in other ways. Their lives are a beautiful testament to the kindness and generosity that a mother passes down.